CHICAGO--(BUSINESS WIRE)-- Hyatt Hotels Corporation (NYSE: H) and San Francisco International Airport (SFO) officially announced today that a Hyatt affiliate has entered into a management agreement with SFO to brand and manage a 350-room Grand Hyatt hotel. Located on the airport grounds, Grand Hyatt San Francisco International Airport is anticipated to open in mid-2019. 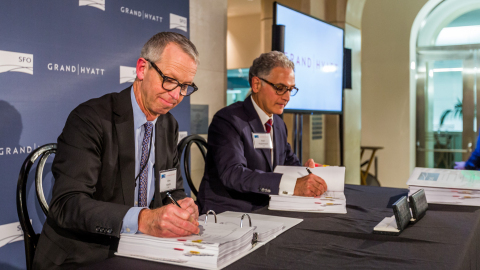 Hyatt Hotels Corporation CEO and President Mark Hoplamazian and SFO Airport Director John L. Martin participated in a signing ceremony on January 21 at the SFO Aviation Museum in International Terminal A. In 2014, SFO, an enterprise department of the City and County of San Francisco, announced plans to develop a new airport-owned hotel to enhance the overall offering of the airport. The San Francisco Airport Commission voted to award the contract to the Grand Hyatt brand under Hyatt’s management in September 2015, and the San Francisco Board of Supervisors approved it in December 2015. With this approval, Hyatt is set to bring its hospitality expertise and award-winning Grand Hyatt brand to SFO, one of the most important airports in the United States, which recently achieved a new all-time passenger traffic record of 50 million annual passengers in 2015. Grand Hyatt hotels reflect the unique culture of their locations and appeal to both travelers and the local community by delivering “moments of more.” Located at the entrance to SFO, Grand Hyatt San Francisco International Airport will sit on a 4.7 acre site close to terminal buildings and parking garages with direct accessibility via an AirTrain station to the terminals. The hotel is being designed with approximately 350 rooms, 17,500 square feet of flexible meeting space, 24/7 business center, health club and spa, indoor heated pool, whirlpool, and sauna. Additionally, the food and beverage offerings will include both full-service and casual restaurants, wine and sushi bar, and a rooftop cocktail lounge. Grand Hyatt San Francisco International Airport will be uniquely designed to reflect its distinct environment within a backdrop of intuitive service, dramatic architecture and innovative design. During the signing ceremony, the design-build firm for the hotel was also announced. Webcor Builders and Hornberger + Worstell Architects will be spearheading the design work together with SFO and Hyatt’s design team. The design is envisioned to be among the most innovative and environmentally friendly airport hotels in the world. SFO will construct and own the hotel while Hyatt will provide branding and day-to-day management. Construction on the project is expected to begin in the fall of 2016, with completion expected in mid-2019. The facility is being designed to achieve both a four star designation and Leadership in Energy and Environmental Design (LEED) “Gold” certification for environmentally sustainable design and operation. San Francisco International Airport (SFO) offers non-stop flights to more than 40 international cities on 34 international carriers. The Bay Area's largest airport connects non-stop with 77 cities in the U.S. on 13 domestic airlines. SFO is proud to offer upgraded free Wi-Fi with no advertising. For up-to-the-minute departure and arrival information, airport maps and details on shopping, dining, cultural exhibitions, ground transportation and more, visit www.flysfo.com. Follow us on www.twitter.com/flysfo and www.facebook.com/flysfo.